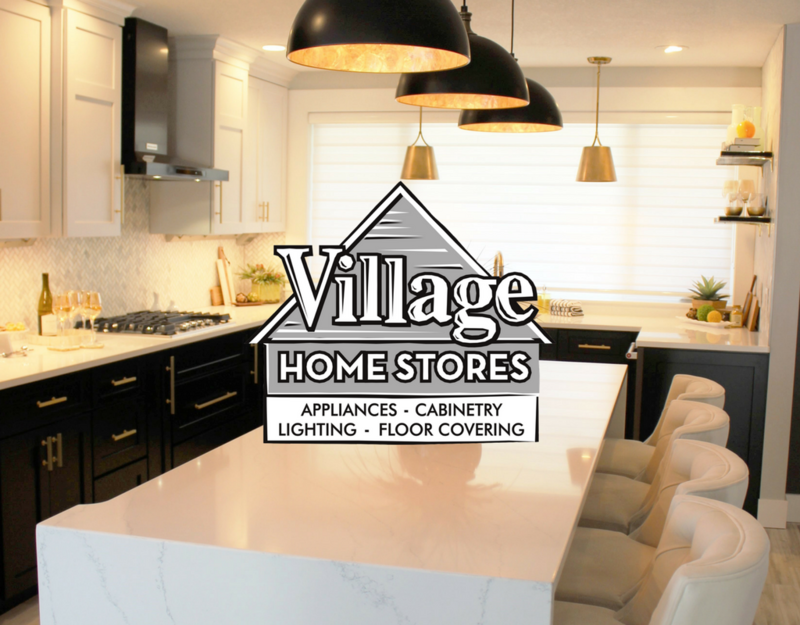 At Village Home Stores we offer a variety of cabinetry products so that we can suit any budget and need in the Quad Cities area. When those needs are a completely customized cabinet layout and a chic custom paint and finish, our Amish-built cabinetry from Four Acre Wood Products is perfect! 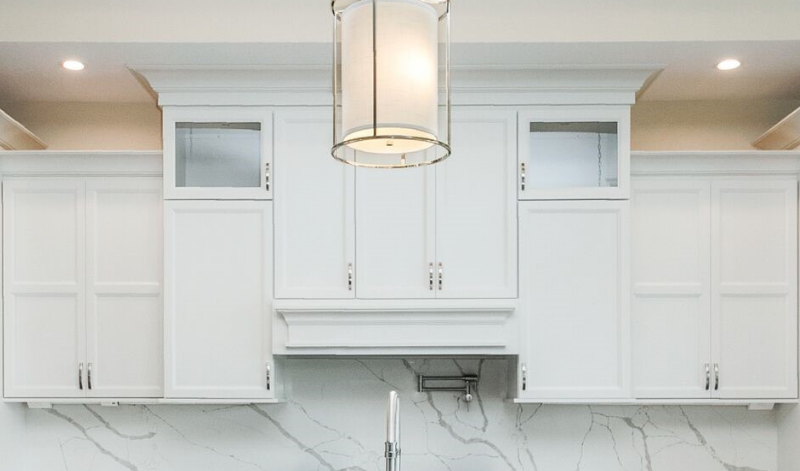 Since Mother Nature has blessed us with so much bright white snow this week, we wanted to return the favor to you with this bright white kitchen feature. Take a look at this stunning space in a recent home we worked on with Heartland Builders of the Quad Cities. 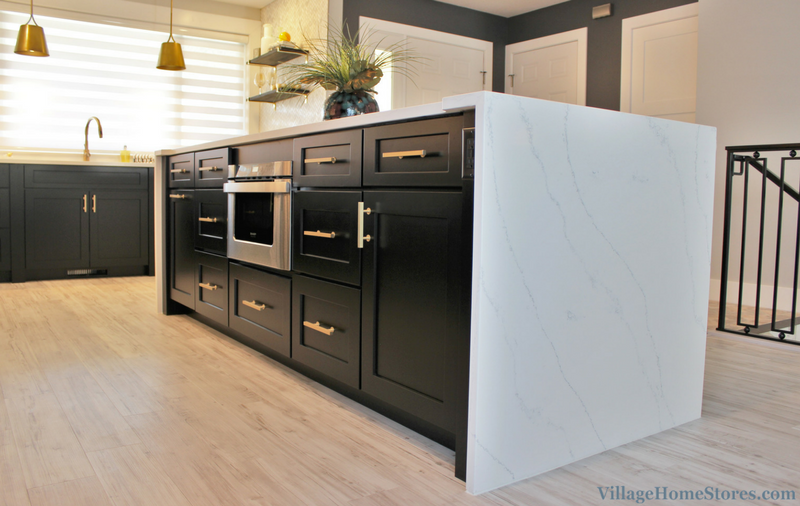 Custom kitchen cabinetry and Quartz by Village Home Stores. Photo and home by Heartland Buidlers of the Quad Cities. This bright white kitchen just HAD to be featured this week because the paint color is appropriately named “Winter White”. 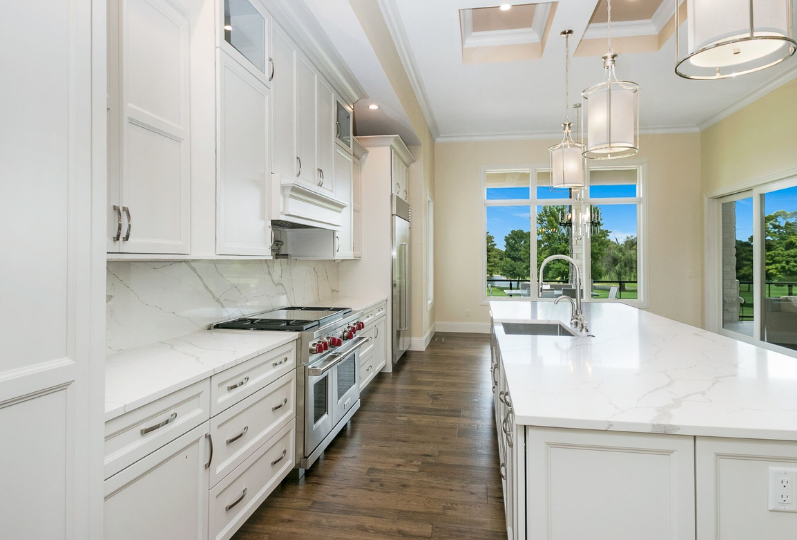 There is truly nothing more classic than a flat-panel kitchen cabinet painted white. 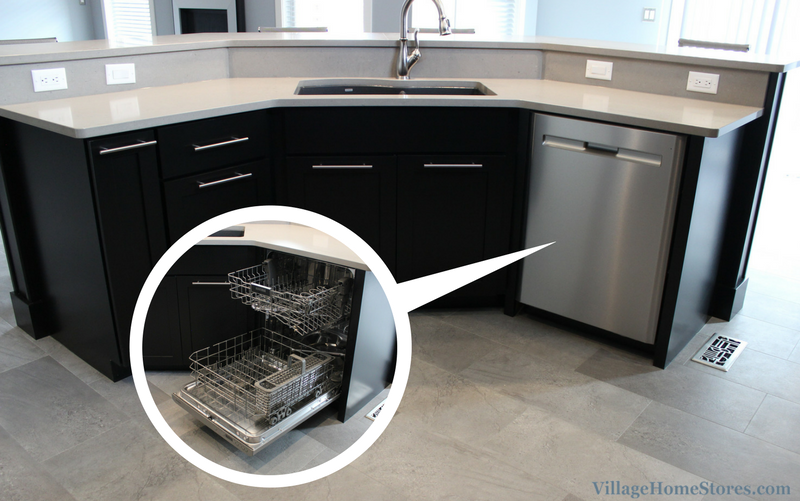 It has rested comfortably atop every Kitchen and Bath showroom’s bestselling list for years and has shown no signs of getting kicked off the top of that list. In this open-concept great room space the bright white painted cabinets are a perfect way to keep the entire room feeling light and inviting. 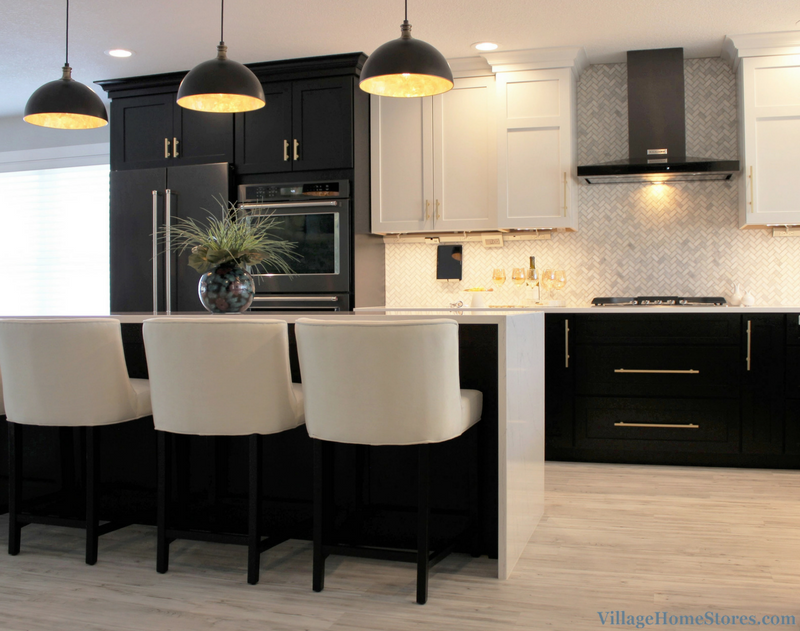 Custom kitchen cabinetry and Quartz by Village Home Stores. Photo and home by Heartland Builders of the Quad Cities. This single image (above) is such a crash course in design we love it so much! How can you keep a single-wall kitchen design from feeling sterile or too contemporary? Careful consideration of your details and keeping a balance with those choices. Scale, rhythm and symmetry are so key in any successful design. Notice how instead of two pendants above that large kitchen island above, there are three? That’s because the scale of light fixture suggests using three to keep that great balance for the eye. Select a larger pendant light and instead two lights would look right. But how is rhythm found in design? Scroll back and “read” the image from left to right and notice what elements repeat. There is a rhythm to it! The staggering up and down of cabinet heights, the doors on the back of the island, the glass in the hood cabinet area, and those pendants. Of course the beautiful symmetry of the design is soothing to any eye. The walking pantry front on the left is complimented by the tall refrigerator area on the right and so on. Split this kitchen design down the center and the balance is so great that even Marie Kondo herself would have nothing left to “tidy” up about it. So Why Choose Custom Amish Cabinetry? As we mentioned before, we have a wide variety of cabinets available at Village Home Stores. From semi-custom, stock-sized cabinets to completely handcrafted heirloom-quality custom cabinets. So why invest in the latter? Because if craftsmanship and quality is something you value, then you will make it a priority for your budget to select one of our custom cabinetry lines. Our mid-range cabinet lines offer upgrades to provide features that are just considered standards for a custom line. With even more upgrades that are available to take your cabinet design to that mentioned heirloom-quality level of craftsmanship. For instance, this Coal Valley kitchen includes soft close hardware on all drawers and doors as well as an all plywood cabinet case, lock-mitered exposed ends, and hand-sanded drawerboxes. 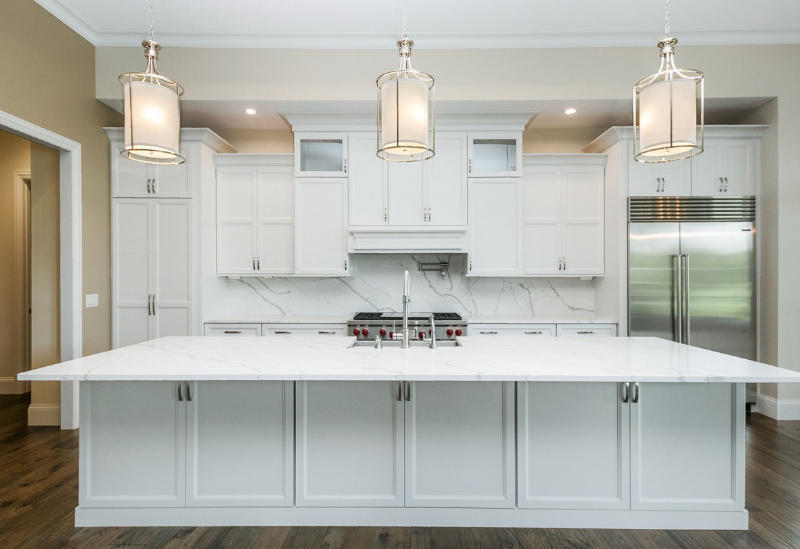 With a custom cabinet line you also have the ability to view and build the kitchen design as an entire completed look, not individual boxes of cabinetry. Sections of cabinetry like the wood hood area and surrounding wall cabinets (shown above) can be built as one section of cabinetry instead of four cabinets. This makes for a more seamless installation and furniture style finished look for areas like hoods, bars, and kitchen islands. Speaking of seamless design, how about the sleek look of these quartz counters extending up as a full-height backsplash! 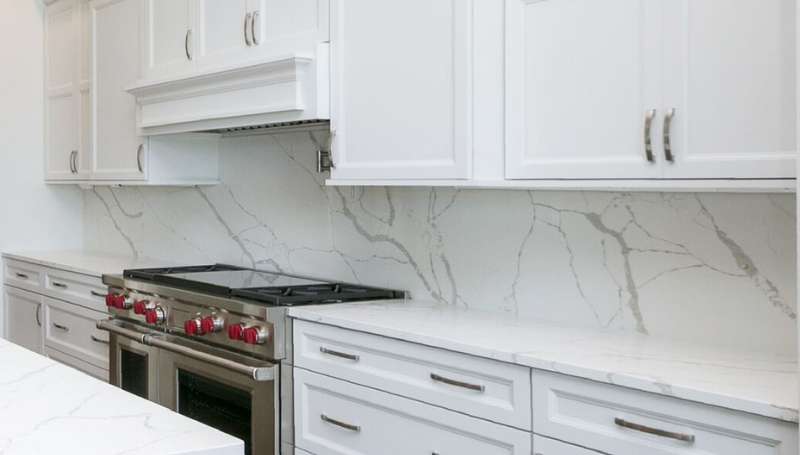 Full-height kitchen backsplashes are such a classic look and we have been installing so many more of them in both traditional and transitional spaces. A single-wall kitchen design like this is a perfect location for this design choice. The look is fantastic and of course the surface is so much easier to keep clean than a tiled and grouted surface. 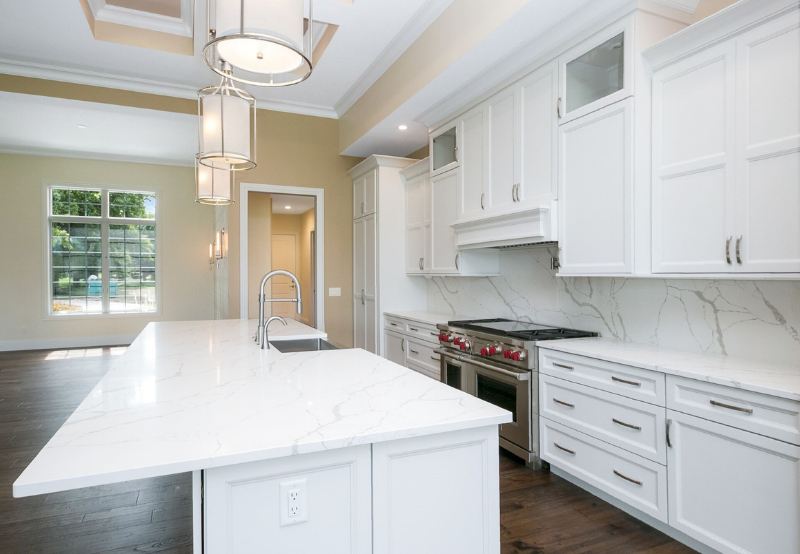 This quartz is from our Q Quartz line and the faux marble look design is named “Calacatta Laza”. 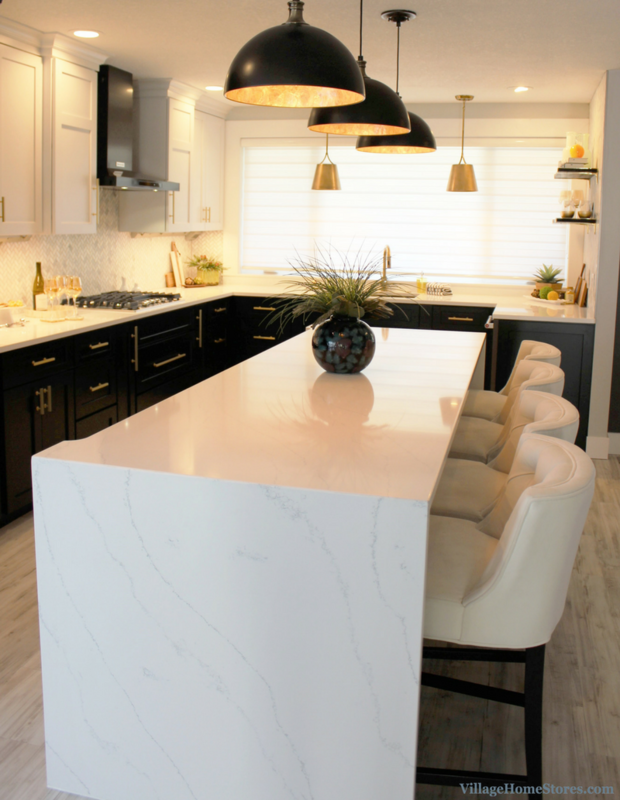 Calacatta Laza marble-look quartz counters from Village Home Stores. Want some even better news!? This Q Quartz color is one of our promotional-priced 2019 quartz colors! Read more about this promo quartz program and see all 15 of the colors here in a past blog post. If you are looking to refresh your existing kitchen or if you are not sure about your counter surface budget for a full project, give these promo quartz colors a chance. 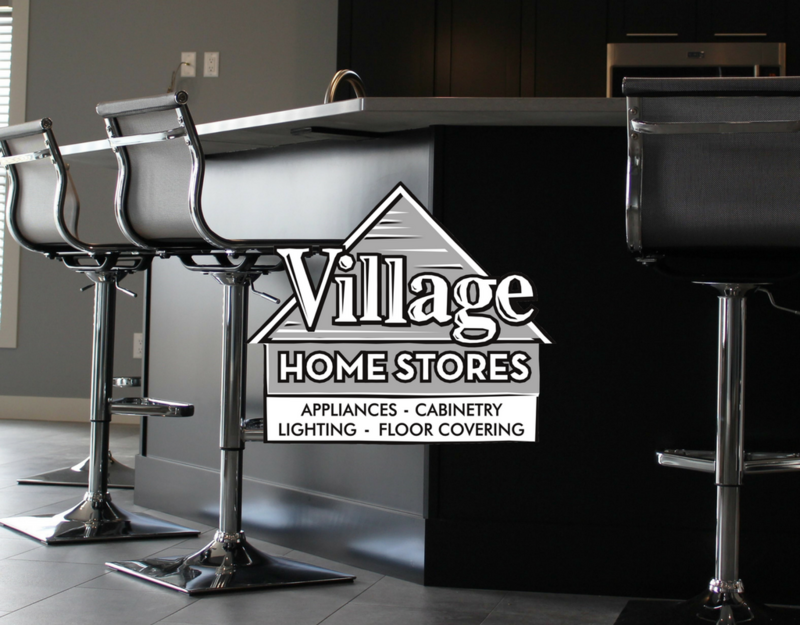 A kitchen designer at Village Home Stores can quote you a price for your tops very quickly and easily. Just reach out to our team with some basic measurements. Custom floating bath vanity with vessel sink and Cambria Quartz by Village Home Stores. Photo and home by Heartland Builders of the Quad Cities. 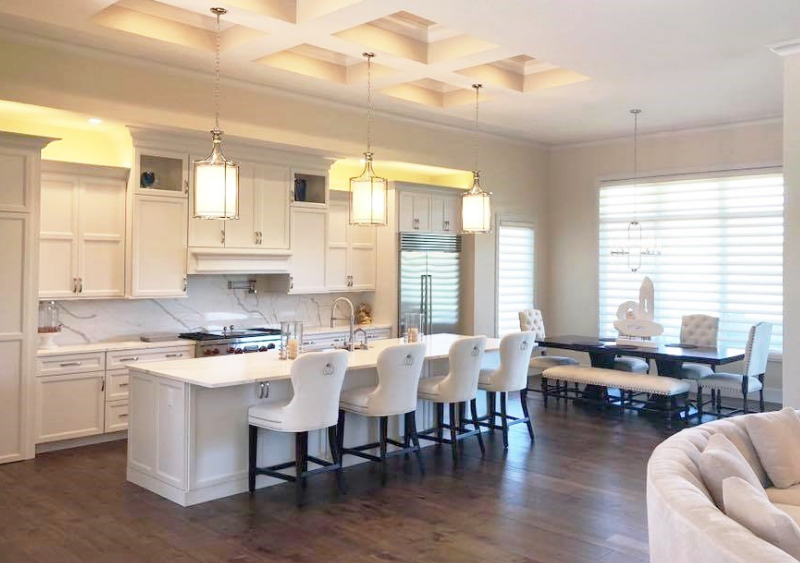 We also provided the cabinetry and countertop surfaces for the rest of this gorgeous new home. 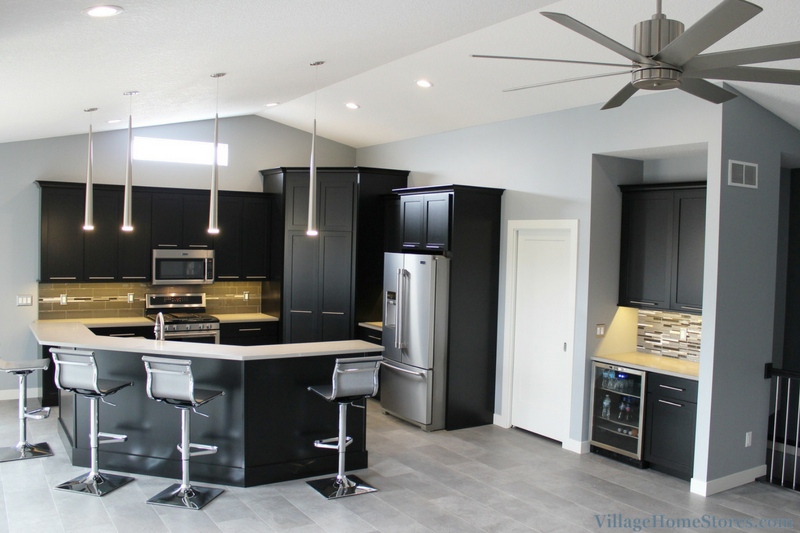 We wanted to share two of the other spaces with you that had a contrasting painted “Matte Black” finish to the bright white kitchen. The first is a slab-style floating vanity we designed for the main bathroom. Floating vanities make such a unique statement and against the textured wall, this look is so fantastic! We also love that the clients chose a vessel sink to add to the vanity statement. The quartz counter surface in this bathroom is the Cambria “Blackwood” design. 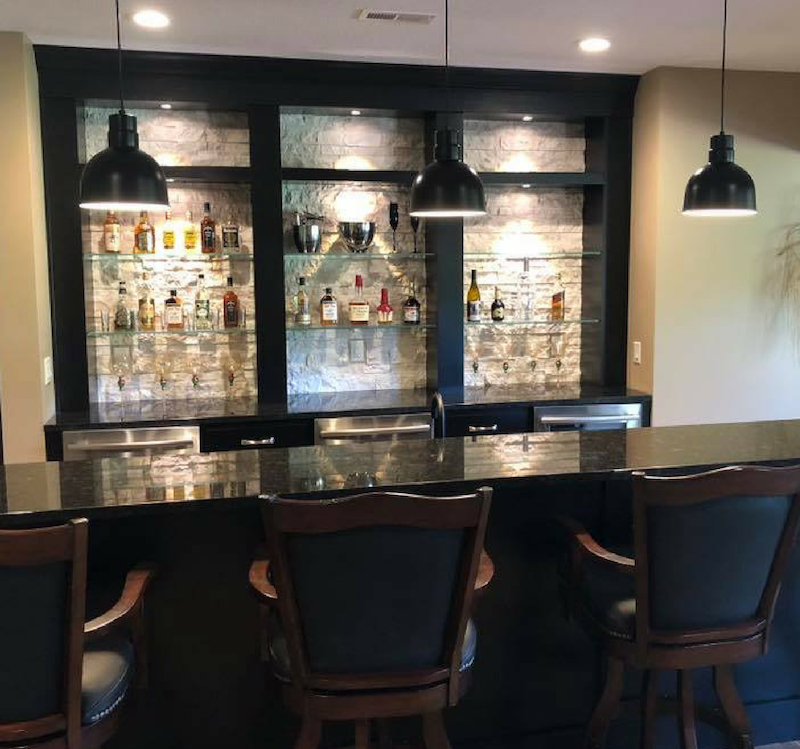 Home Bar cabinetry and Granite by Village Home Stores. Photo and home by Heartland Builders of the Quad Cities. We would love to raise a glass and toast this fabulous home bar area as well! The “Hastings” door in a painted black maple wood is from our Koch Classic line of cabinetry. 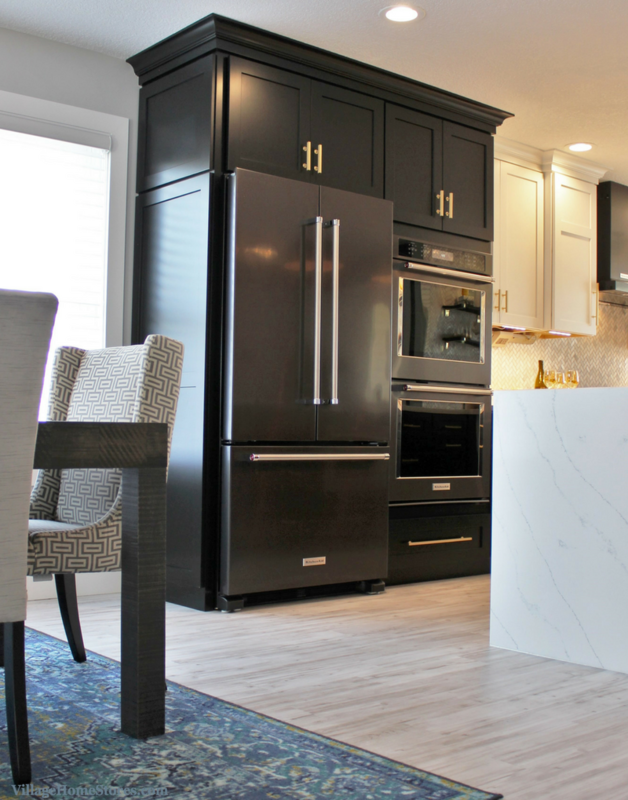 We have paired the rich, dark cabinet finish with “Black Pearl” granite countertops. There is something so sophisticated about a glossy, polished granite top that really makes it take this home bar area to a “top-shelf” look! We also installed this same polished Black Pearl granite in an outdoor kitchen at the home (yes, we can help you make a stunning outdoor kitchen too). Love the look of these finished spaces? Then be sure to check out our album of images from this project here over on our award-winning Houzz page. 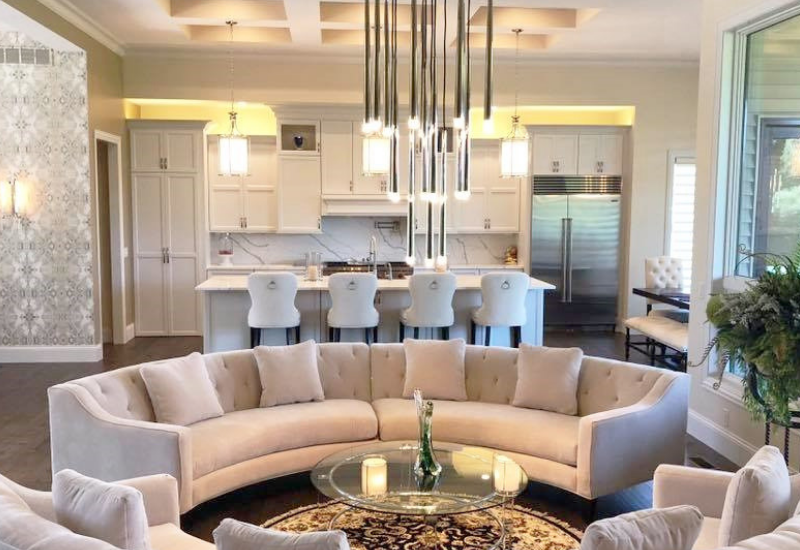 We want to thank these incredible clients and of course Heartland Builders for letting us show you this custom-designed space from Village Home Stores. If you are building or remodeling soon we want to be a part of it! 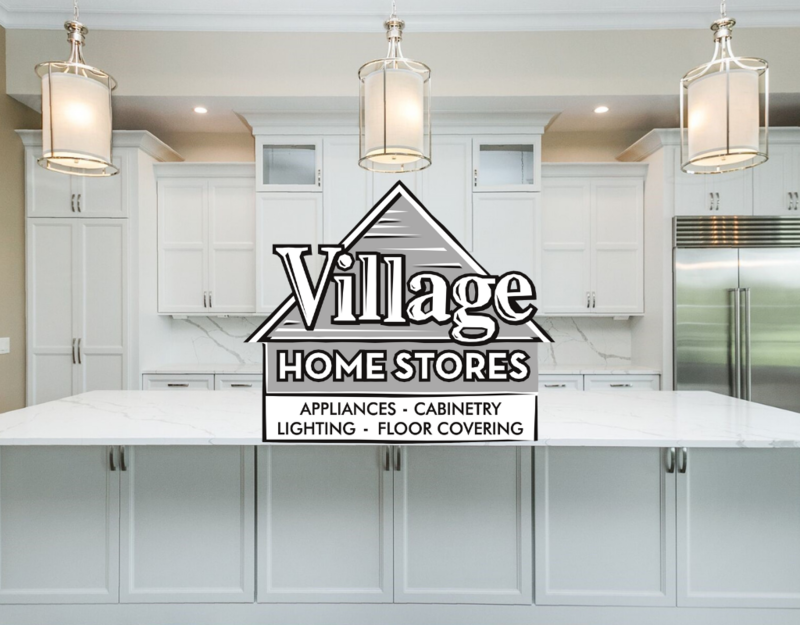 Village Home Stores is your regional kitchen and bath destination located just a short drive from many surrounding Quad Cities area cities. Our showroom is open Monday-Friday from 9am to 5pm and Saturdays from 9am to noon. We are also available by appointment outside of those showroom hours. Ready to start the conversation about your own project with us? Your first step is to reach out. You can reach us at 309 944 1344 or by completing this short online form. We can’t wait to hear what you are working on. So what is black and white and gold all over? 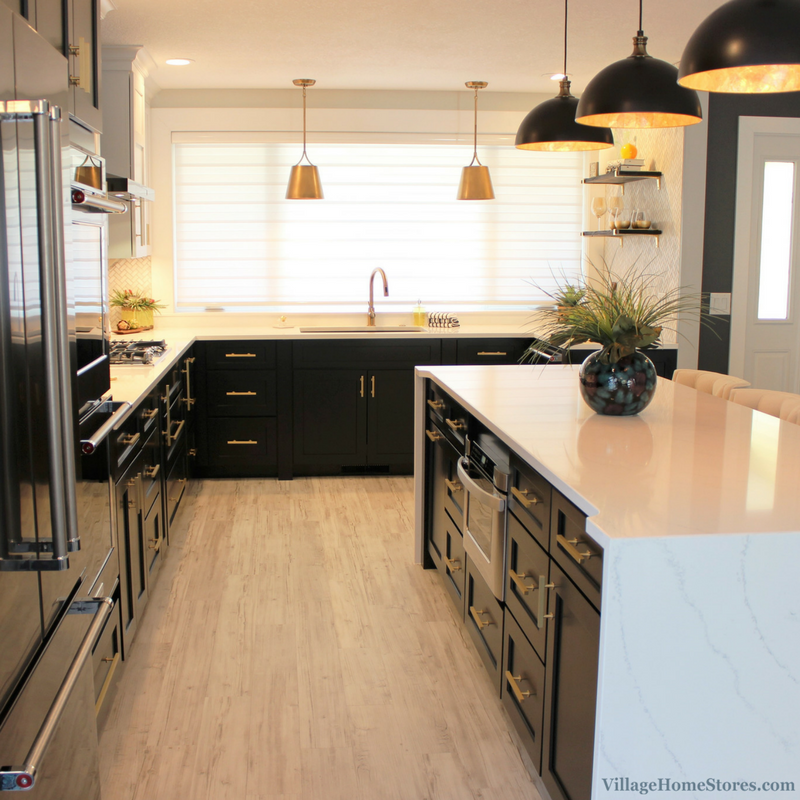 This perfectly on-trend kitchen remodel in Coal Valley, IL. A Transitional style space that is tasteful and right on trend! 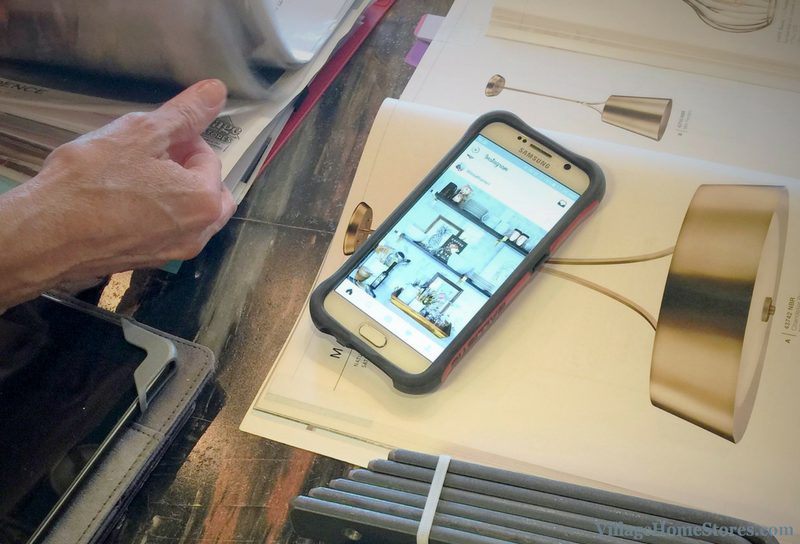 We originally met with this customer about estimating design and materials for her brand new home. Instead she ended up finding a great existing home opportunity in Coal Valley, IL. 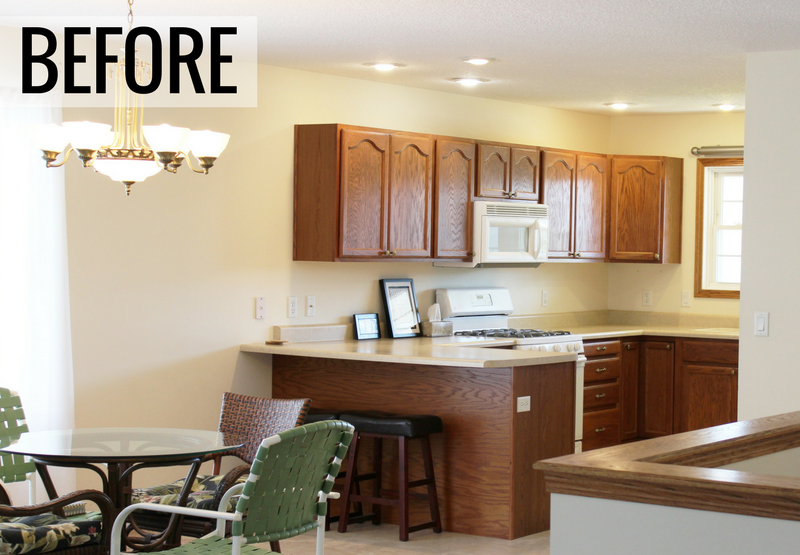 She then began working with us to remodel this home completely to now reflect her own taste and personality. The home was in great shape and already had a very functional layout to work with. The 1990’s finishes however, were ready for an update. Medium Oak cabinetry, laminate counters, and beige paint graces every room. Here is a peek at the original kitchen that included a peninsula and white appliances. There was already a space adjacent to the kitchen for a dining area. This customer worked closely with a team from Village Home Stores and her own contractors to take the 90’s property not only up to date… but magazine cover worthy! 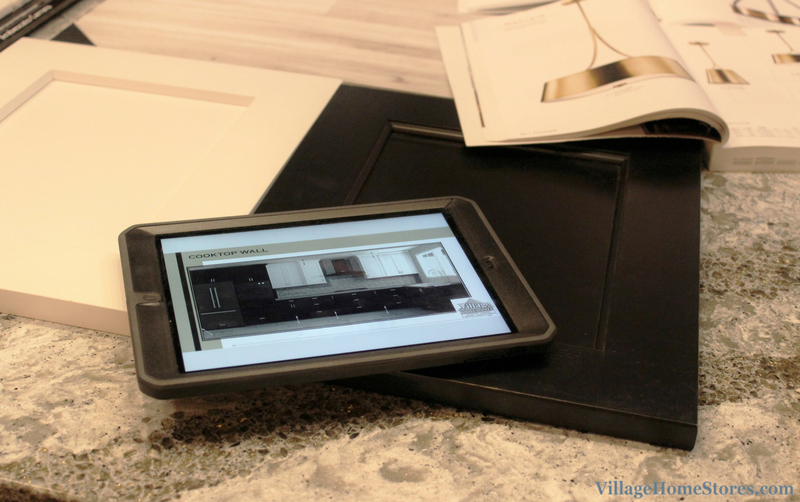 When you work with Village Home Stores, part of our process is to present you with full color renderings of your designs. This is our process whether you are building or remodeling. In a remodel of this size, the renderings help to visualize the shift of the entire style of a home. Seeing the vision in a rendering helps out so much! Our experts work with you to make sure the complete design and all the selections within it will work perfectly AND reflect your own tastes. In this case, the tastes of our client were sophisticated and stylish! Two-tone kitchen design has seen some major shifts over the past few years. Originally, the most comfortable way to two-tone a kitchen design has been to add a second finish to a freestanding kitchen island. A refreshing new approach has been to install a dark base cabinet and a lighter upper cabinet in a design. We see this with darker graphite grays, blacks, and even navy blue. 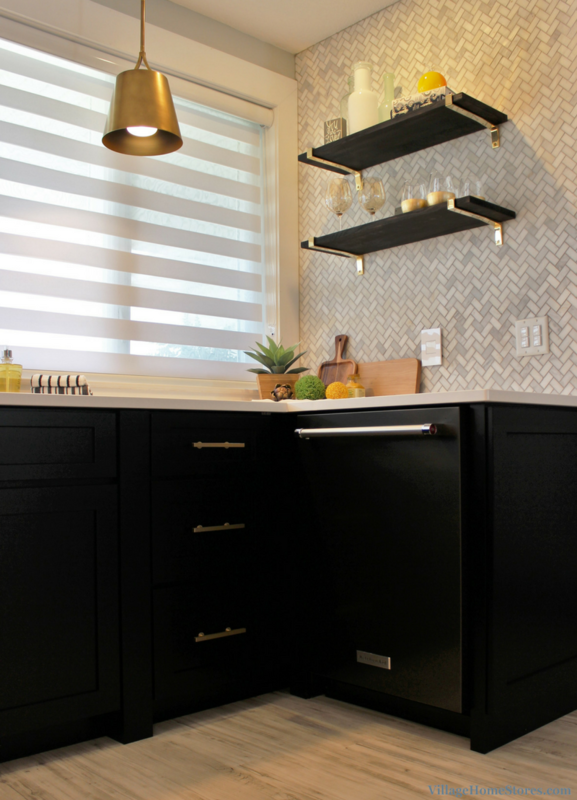 Painted black and white cabinetry from our Koch Classic line in the “Savannah” door is complimented with a Cararra Marble backsplash in a herringbone pattern. A single-level island in the center of the design seemed to almost appear to be wrapped in ribbon. That ribboned look is a waterfalling quartz installation. 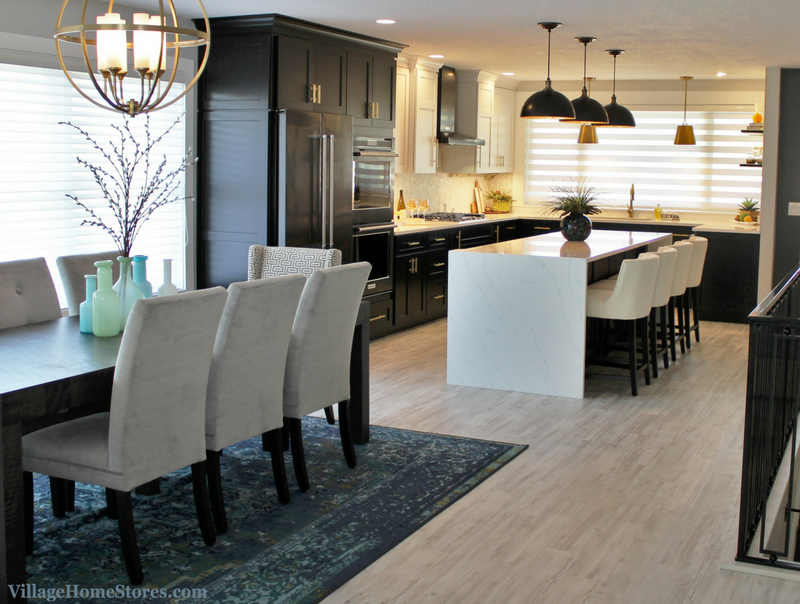 Hanstone quartz “Tranquility” is installed as the island countertop and the perimeter is a solid white “Royale Blanc” design. With the peninsula now removed, that left plenty of room for a large island to stretch the full length of the kitchen. A Microwave drawer by Sharp® is at the center with a large drawer below. The microwave is surrounded by wide drawer stacks and added storage and a pullout waste basket on the end near the sink. Cascading/waterfalling your countertops could become the jaw-dropping statement-maker you are looking for! We recently installed our new front desk area to include multiple waterfall counters and all of our showroom guest love the look. See those tops here in a past blog post. 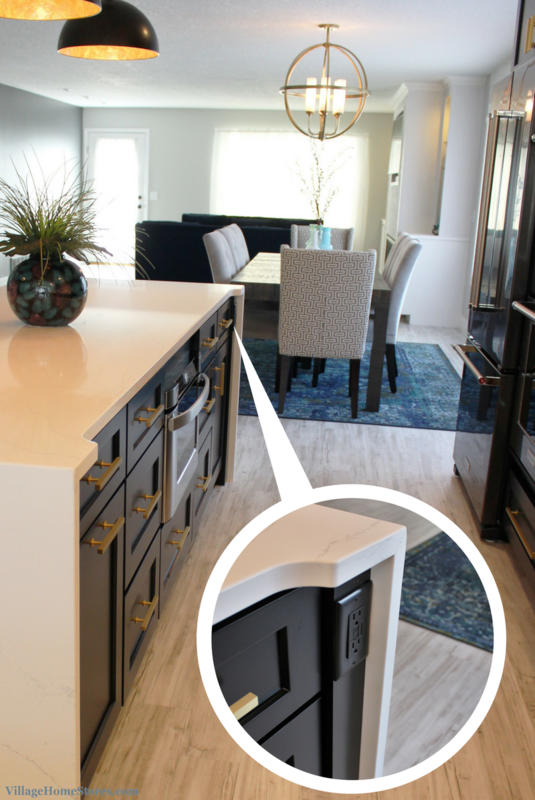 With the quartz counters “wrapping” each end of the island, that doesn’t leave a great space to include an outlet. A large island like this in a great room space demands entertaining guest. Can’t you just picture this place full for a Holiday get-together? Power is needed for small appliances or even charging electronics when working from the island seating. We concealed the outlet right on the end beneath the decorative corner detail. The matte black outlet and cover blend perfectly. The kitchen island seats four and the nearby Dining area can accommodate more formal Dining guests. A 6-light gold orb fixture by Quorum hangs above the large dining table. Not only did this client have a very clear idea of her own personal style, she was incredibly organized with her inspirations! If you are dreaming of a new kitchen but know it will be a few years down the road, start honing your own tastes and inspirations now! Not only did this client come to us with a contagious enthusiasm, she also came with binders full of ripped out magazine photos, Pinterest boards, and even Houzz ideabooks. The open shelf wall of her design came inspired by an instagram post by Kristin on the Bliss at Home blog. We think this corner of the kitchen design is such a beautiful way to add a space to personalize and customize the kitchen throughout the year. The Cararra Marble herringbone backsplash tile is installed from countertop to ceiling. 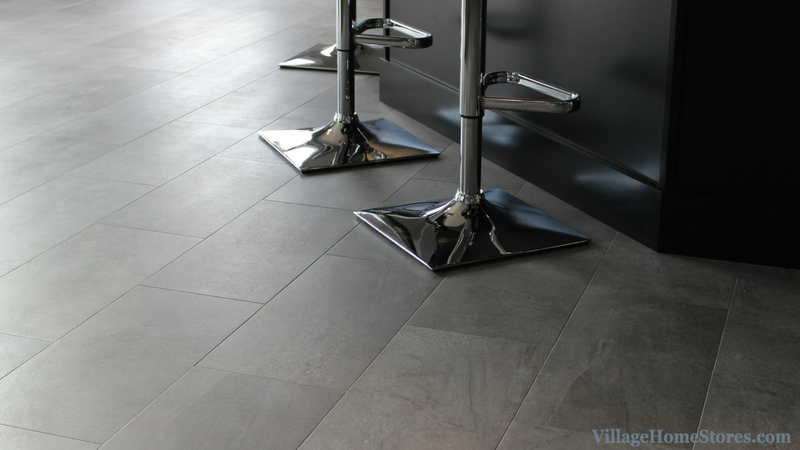 This tile from Epic Stone adds texture and detail without being a distraction or too busy. Marble cut into small tiles provides a timeless tone-on-tone look. 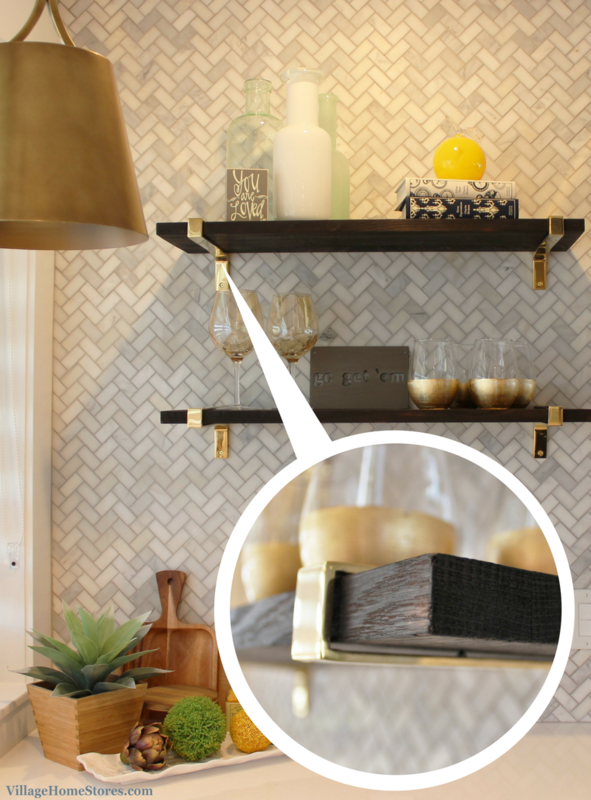 The gold shelf brackets are just one of the many gold accents throughout the space. The custom shelves are an Oak wood that has been charred. Charred or blackened wood accents are beginning to become a huge home accessories trend and we love introducing this look into the kitchen. The Japanese charred wood technique is called Shou Sugi Ban or Yakisugi. The charred wood compliments the Black painted base cabinets so well and adds another unique texture to the design. The finishes are not the only thing that saw an update. Our adorne® collection of outlets and switches from legrand® add fuction and style to the space. 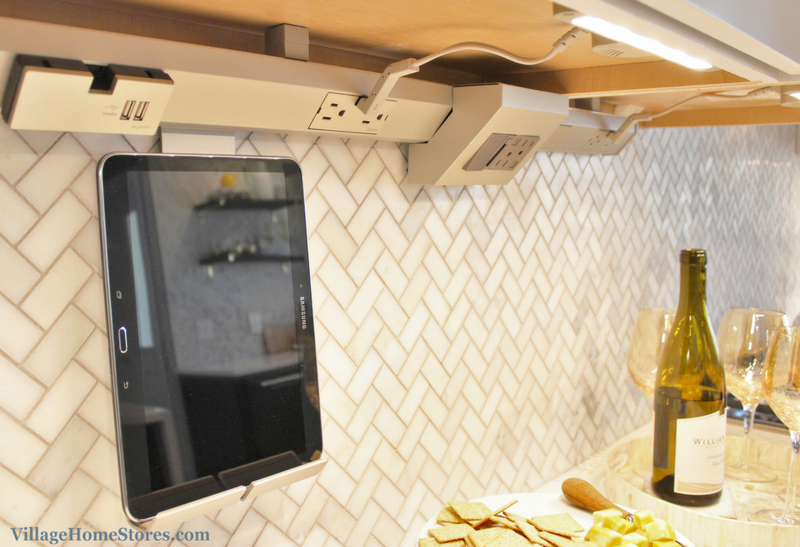 Take a look at this great pop-out outlet below the open shelves. Power when needed and concealed and stylish when not in use. Plus this single outlet packs a lot of power. This single pop-out includes 4 outlets! 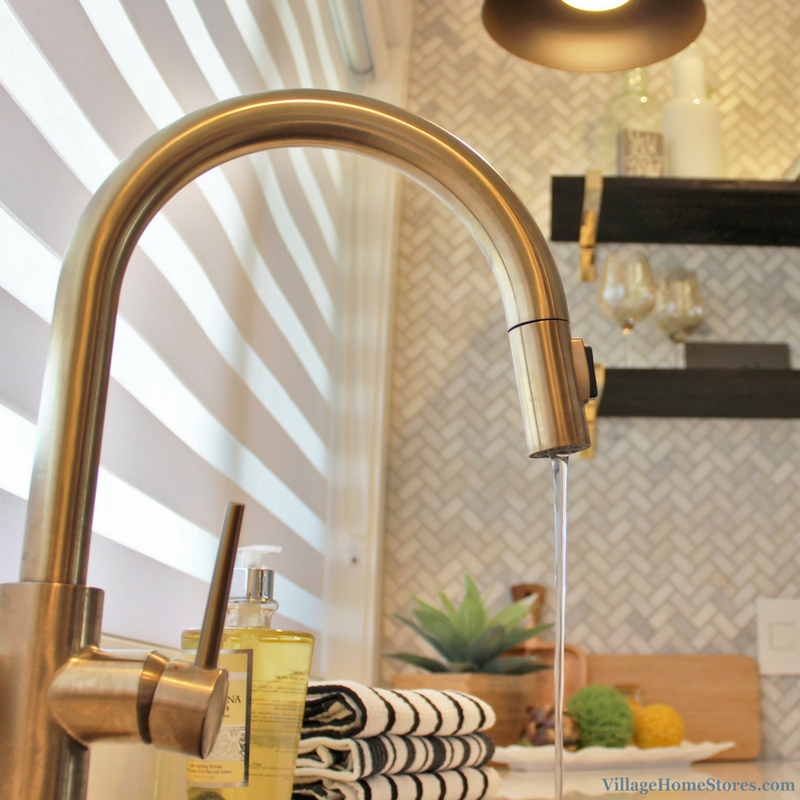 A brushed gold kitchen faucet adds another place for that pop of gold accent. This faucet also has a pull-out spray wand. Selecting a accent color is only half of the process of executing it well. Accenting is all about balancing scale and locations of your colors. This kitchen includes pops of gold found in the lighting, hardware, and accessories. The underside of the kitchen island pendants give a peek-a-boo approach to the accent. These pendants are named “Placuna” and come from our Uttermost line. Due to the large size of the new kitchen window, a single light wouldn’t seem appropriate. 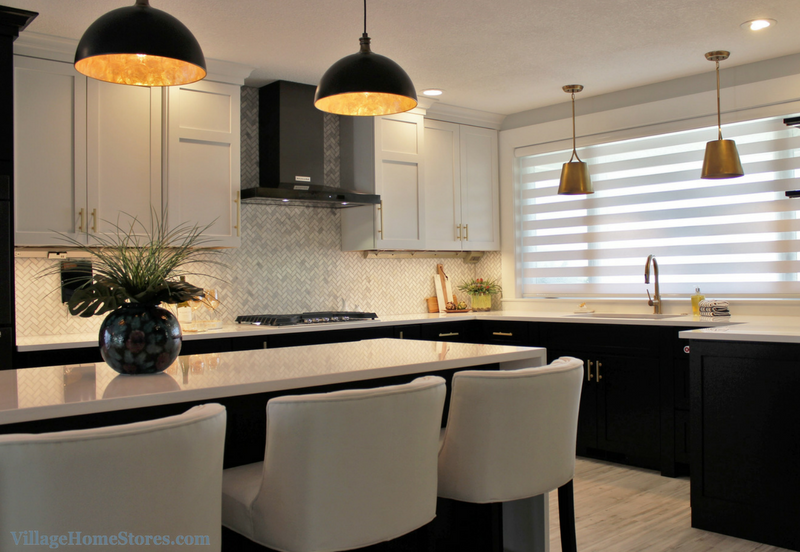 Two 10″ wide Kichler “Maclain” pendants hang framing in the sink area. The same legrand series that makes the pop-out outlet mentioned above also offers a modular undercabinet system. 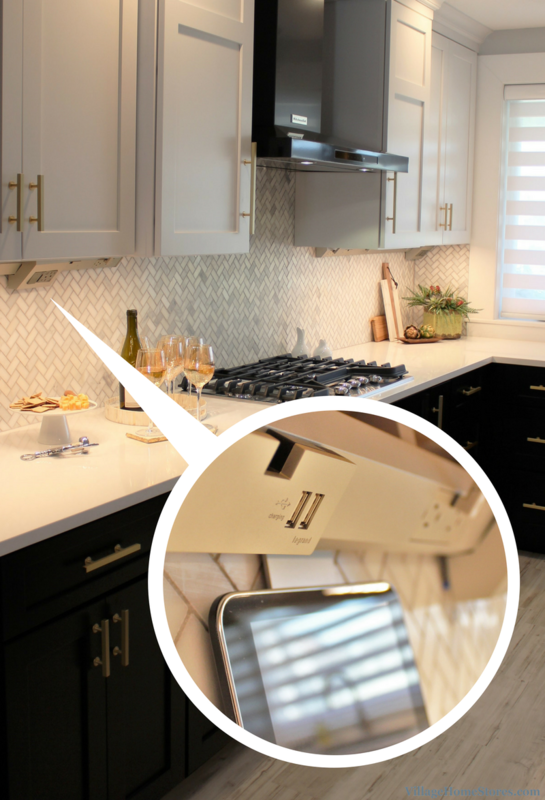 This unique system of lighting, outlets, and electronic docking accessories can be customized and changed to accommodate the kitchen needs. All of the outlet and USB boxes can be pulled and moved to other locations. There are also bluetooth speaker inserts and accessories like this tablet dock. 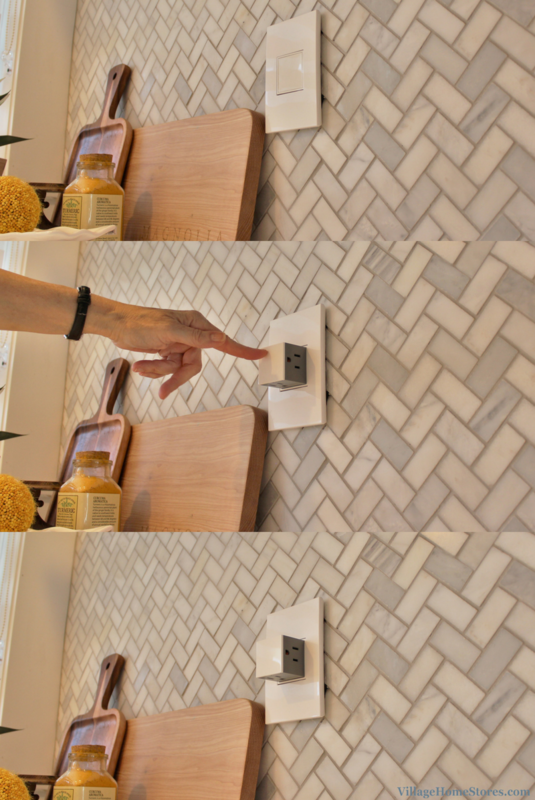 The look is sleek and best of all?, it allows your backsplash tile to spread the full height without being disrupted or distracted by an outlet. For kitchens including a full-height stone or quartz backsplash this system can really be a fantastic solution! 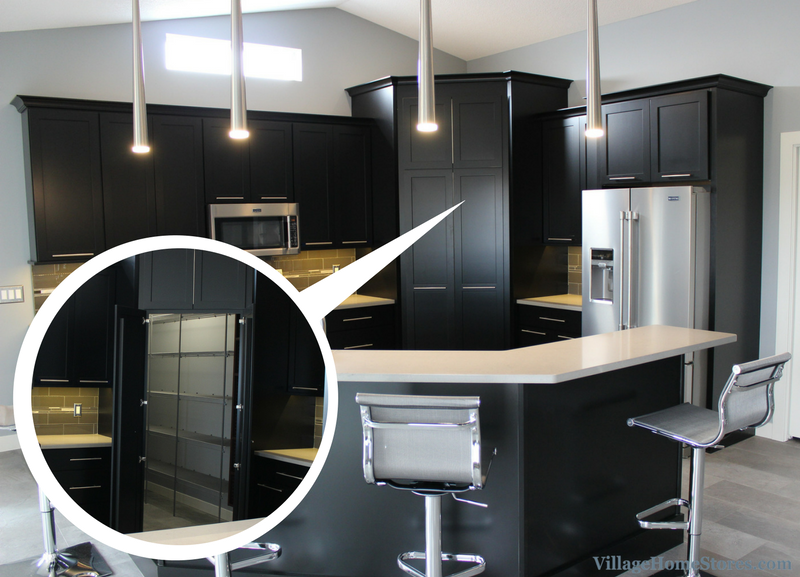 The painted black cabinets from the bases of the kitchen design are repeated in the taller elements of the kitchen. This looks especially stunning because of the new appliances included from KitchenAid®. 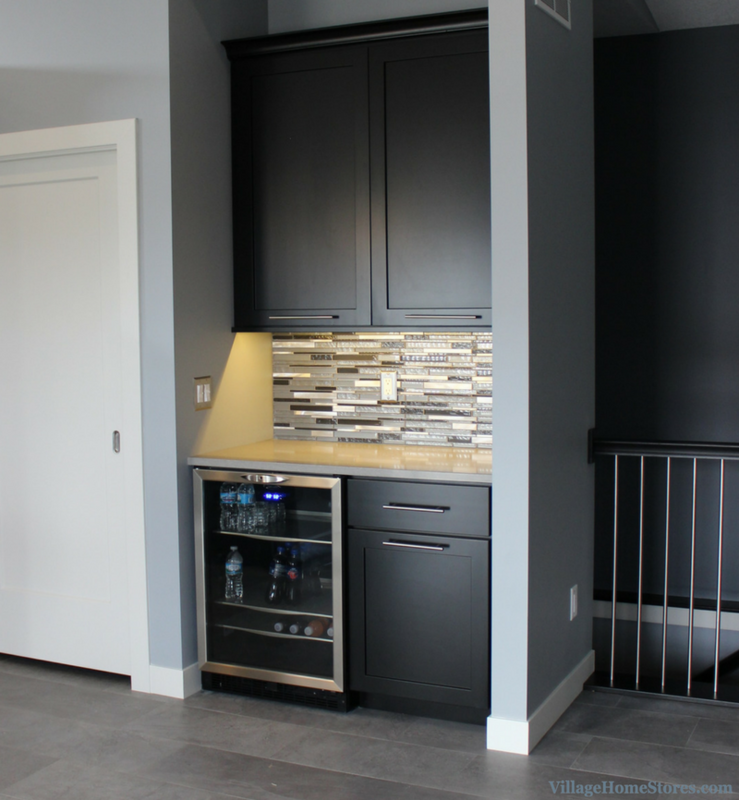 A french door counter-depth refrigerator and double wall oven have been built-in to a painted black cabinet surround. The appliances are in the innovative and stylish Black Stainless Steel finish by KitchenAid®. 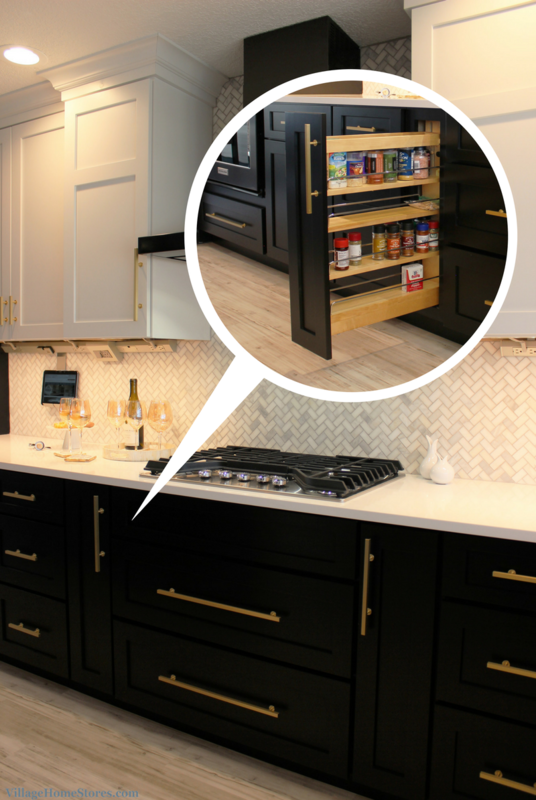 This finish is a true Stainless Steel and the fingerprint-resistant finish creates a matte black look that pairs perfectly with this cabinet choice. 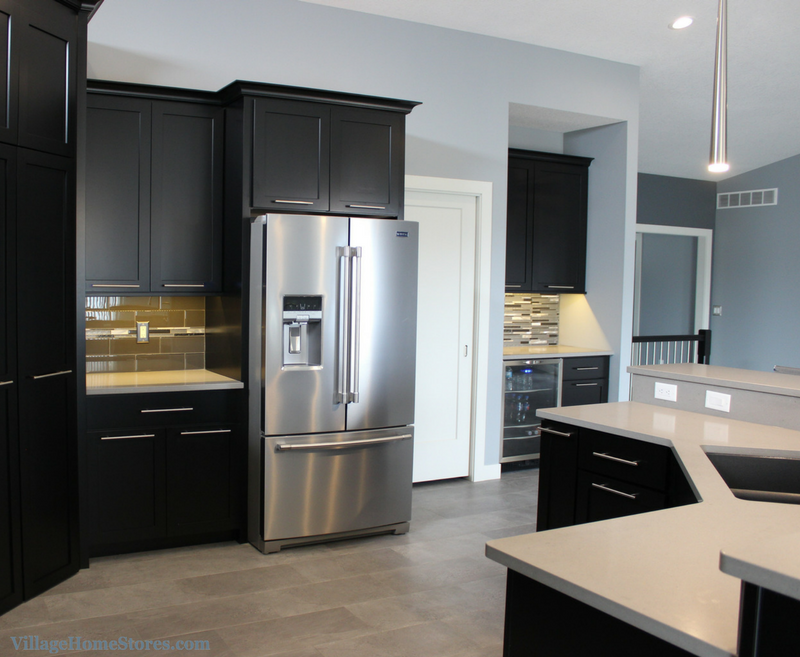 Black Stainless appliances are accented with chrome and Stainless details. This makes them pair well with other metal finishes in a complete design. This kitchen includes a Stainless cooktop and microwave drawer. The kitchen faucet and lighting above the sink are also a brushed golden finish that helps to compliment the stainless texture of the appliances. 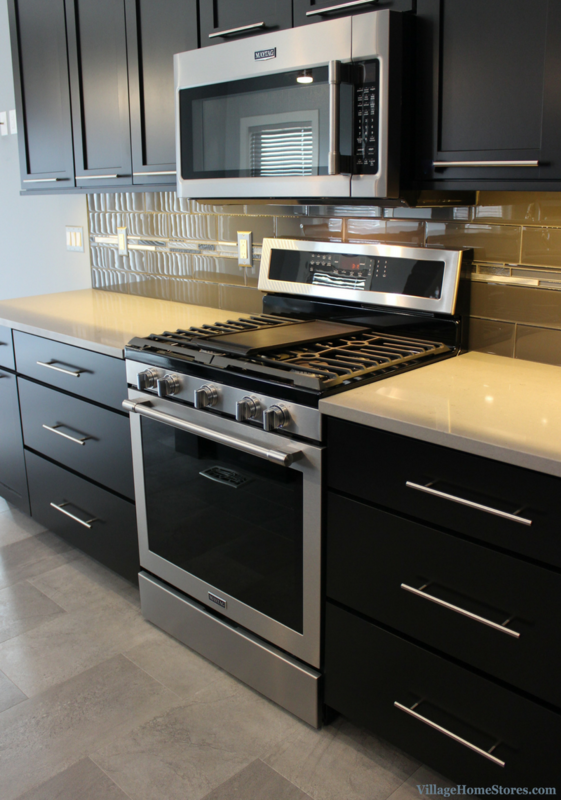 See another great example of mixed metals including Black Stainless here in a past blog post. Of course any dream kitchen must include storage wish-list cabinets. Slide-out shelves, post and pans drawers, and a pull-out spice rack are among some of the inserts included in the design. We love how keeping the darker finish on the base cabinets helps to keep the overall space light and airy. Village Home Stores also offers a full line of custom blinds and shades for your home. This wide new kitchen window has been fit with our Oxford House® “Transitions” shade. While being operated the wide, horizontal stripes overlap to offer an open or closed look even when the shade is down. The shade is the “Dixie White” finish. 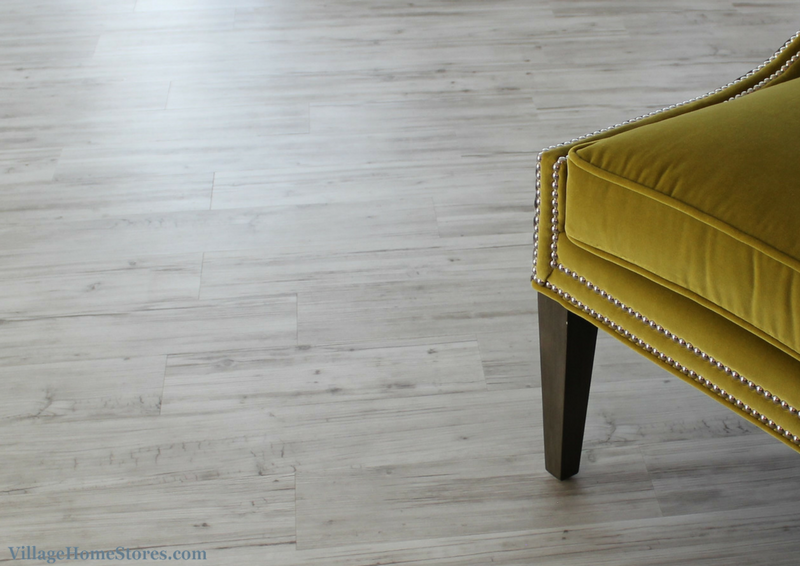 All of this rests on a stunning new Luxury Vinyl Tile (or L.V.T.) from our Fusion Hybrid collection. The gray woodgrain pattern is named “Dutch Pine”. This LVT is installed throughout the great room. See more detailed photos of this kitchen plus some of the other space in this remodeled home here over on our award-winning Houzz page. When we went to visit this finished kitchen to photograph it we noticed a little dish by the kitchen sink. It has a gold-winged flying pig attached to it. The client quickly said “Oh that? My friends and I always joked I would get the dream kitchen I had been planning in my head for year when pigs fly” Well don’t look now but there is a flying pig in her kitchen because it has happened! Have you seen your dream kitchen on Instagram or Pinterest? How about the cover of a magazine while waiting in a grocery line? Even television shows and movies can provide us inspiration for our own dream spaces. 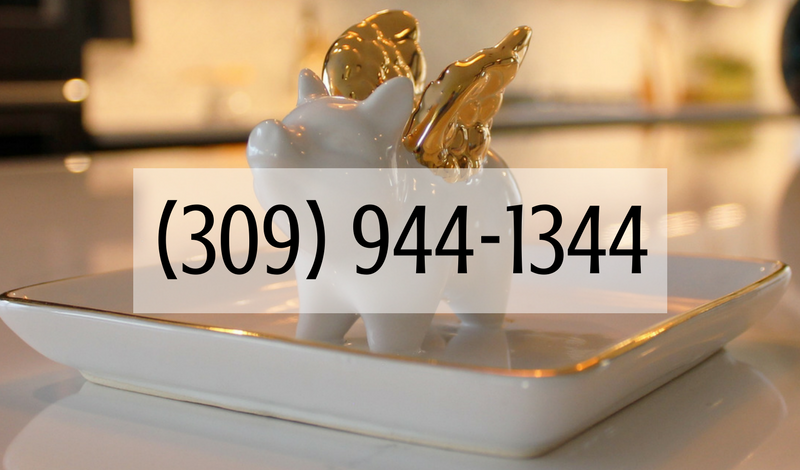 Start collecting your ideas now and contact us as soon as you are ready to start the conversation about your own dream kitchen. 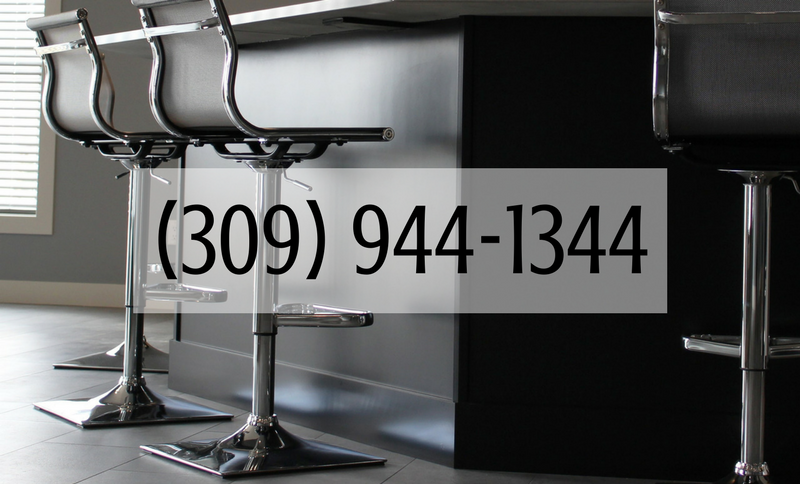 Simply complete this online form or call us at (309) 944-1344 to schedule an appointment. We think we see a pig flying outside your current kitchen window. It’s time. We have shared countless white painted kitchens here on the blog but this space is a refreshing contrast. 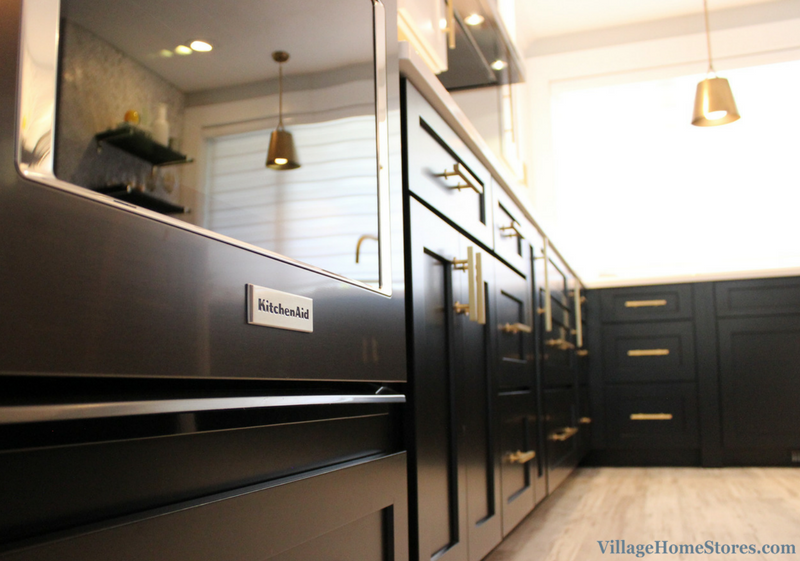 Black painted cabinetry from our Koch Classic line has been installed in the full-overlay “Savannah” door. An L-shaped layout is met in the corner with a pantry and a bat-wing shaped kitchen island angles in towards the kitchen. Seating for 4 surrounds the kitchen island. The kitchen sink is in the very center of the island and a bar-height top blocks view into the sink from the Living Room area. Quartz tops in the “Fossil Grey” color are installed in a standard Eased edge profile. This new Maytag® french door refrigerator includes the easy-to-clean, Fingerprint Resistant Stainless Steel finish. The refrigerator caps the end of the kitchen area and in a small niche for the Great Room a bar area has been installed. This space is stylish and convenient when entertaining. A glass-front beverage cooler from our Danby® line frees up space in the main refrigerator and allows hosts and guest easy access to beverages. Our Diode LED undercabinet lighting perfectly illuminates the American Olean “Appeal” glass mosaic backsplash. This bar area has been tiled completely in the “Transcendent” mosaic. As mentioned before, the appliance package in this new home is by Maytag®. Maytag is dependable and has the warranty to back that statement up! Each of the new Maytag® appliances in this space comes with a 10 year limited parts warranty on the main components of the unit. Stop by or call our expert appliance team at (309) 944-1344 to learn more about this warranty exclusive to Maytag®. The appliances include the french door refrigerator, top-control dishwasher, microwave hood, and convection gas range. Each with their own 10 year limited parts warranty and in the Fingerprint Resistant Stainless finish. We love the look of the commercial-style hardware on the handles and knobs in this sleek space. This kitchen has been installed within a great room that includes a living room area and dining space. The same Luxury Vinyl Tile has been installed throughout the foyer, great room, kitchen, pantry, dinette, hall, mud room, and laundry. This LVT is the “Meridain” series from our Adura click-together line in the “Steel” color. The perfect neutral sleek and stylish platform for this Contemporary styled space. The lighting selections for this home are fantastic and each can stand alone as a very unique art piece! 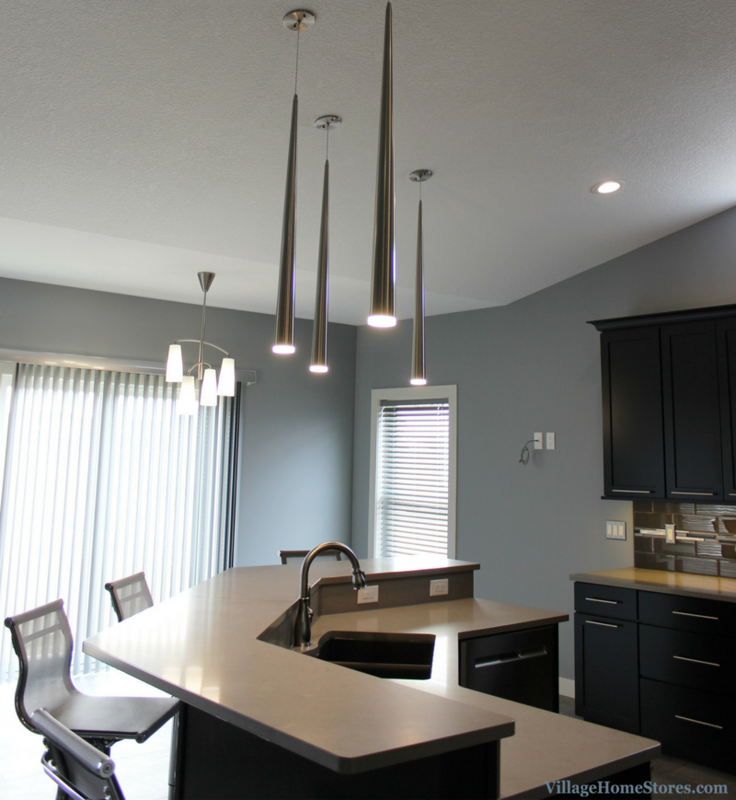 Four elongated LED pendants hang above the kitchen island. These pendants from our Kuzco line are in the Satin Nickel finish. Sometimes a big design impact can be made with a low-profile item. 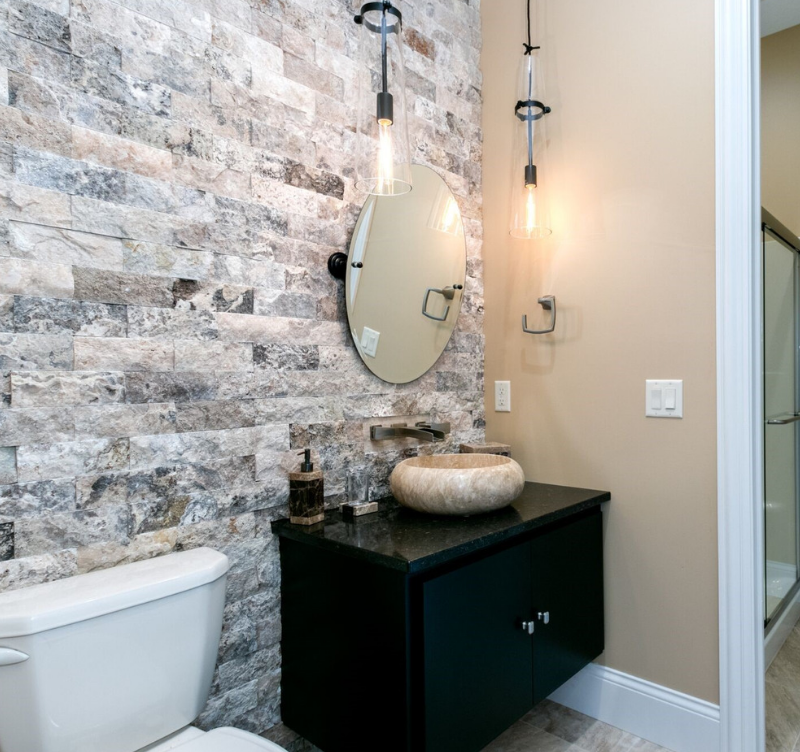 These long, narrow fixtures are a great example. They almost create columns to the island but are easy to see past and around in the open space. 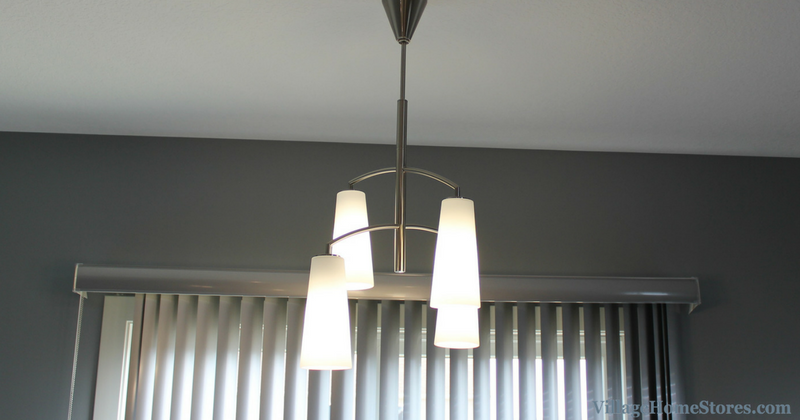 A 4-light chandelier hangs in the dinette area. This light is named “Coddington” and is from our Feiss line. Talk about sculptural! We are reminded of the balance and shapes of an Alexander Calder mobile when seeing this light. 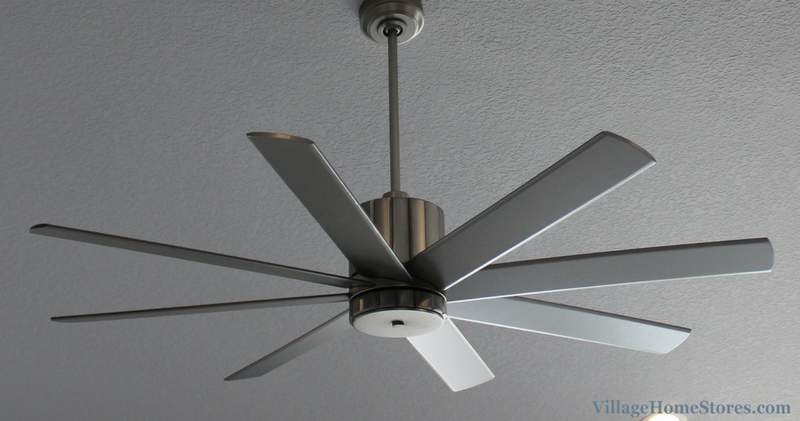 In the great room space a large 60″ ceiling fan is stunning! This fan is named “Proxima” and is from our Quorum line. The Satin Nickel finish is a perfect choice in this completed space. When turned on, it provides a lot of air flow and when the fan is turned off, it has an almost sculptural look. That corner pantry may look large enough, but open the doors and you will find that this is just a pantry front. This cabinet walk-through pantry front leads to a large walk-in pantry area. There is plenty of style AND storage in this space. New homes like this tend to have an “Open Concept” to the spaces but you need to plan for including plenty of storage options concealed from that “open” area. This walk-in pantry if perfect for food storage but also can be great for other bulk household items. Are you planing on building a new home soon? Perhaps considering remodeling the one that you are in? No matter what your project or budget is, we are excited to hear about it! Our award-winning team will help you determine your own personal style and create a complete design with you that reflects you and your tastes. Learn more about Heartland Builders here and be sure to reach out to us with any questions about what you have seen or read here. See the full album of photos from this project over on our award-winning Houzz page here.